I haven’t seen any wedgetail eagles around here for a few years. I believe they develop several nesting sites and rotate around them over their lives. 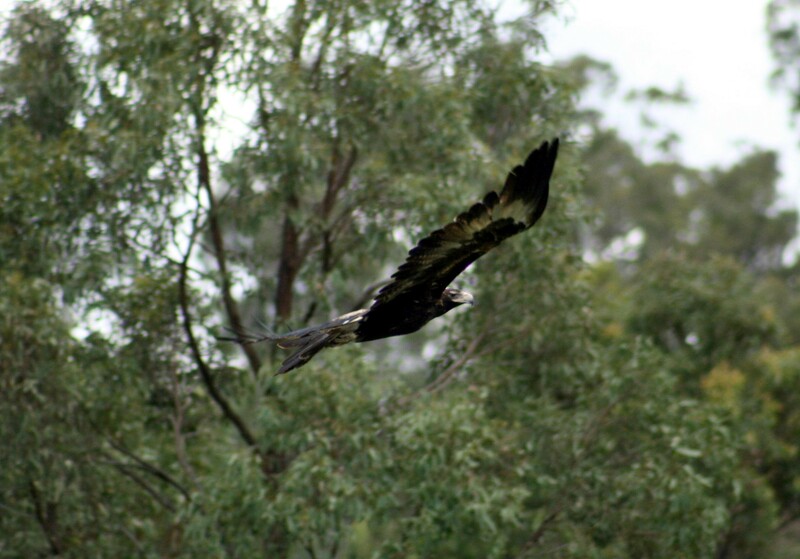 Usually, we’ll see them in flight, waaaaay up high circling – but today was a lovely “welcome to country” from the couple. As I drove in, over one grid, hang a right, through the boggy patch and straight on over the gravelly bit. The track veers right and down/up a couple-a hills before the last chicane down to the house. And there they were. Sitting low on a tree’s branches – maybe they’d just fed? Unless you’ve seen them, you have no idea how friggin HUGE they are. And beautiful, just beautiful. I turned off the engine, grabbed the camera and walked up slowly. The lady moved off to a tree further away and the man followed. They were not concerned, but sat on the far side of the next tree trunk so they could play hidey –go-seek with me. I took it slow but knew they’d move again. Girl first, boy second. Big wings beating, but not going up at all. They flew at level over to another copse of trees. I blew my camera battery entirely – and then when unpacking – realized I’ve forgotten my charger! Typical. One battery to last a week. This will be tricky – but I’ll go for a walk up to the old nest to see if they are any signs of recent renovations. Wish me luck.